The last card from the Camelot Oracle comes to join us and if we were unsure about starting a new adventure, we need not be, for it promises to be more than we think. 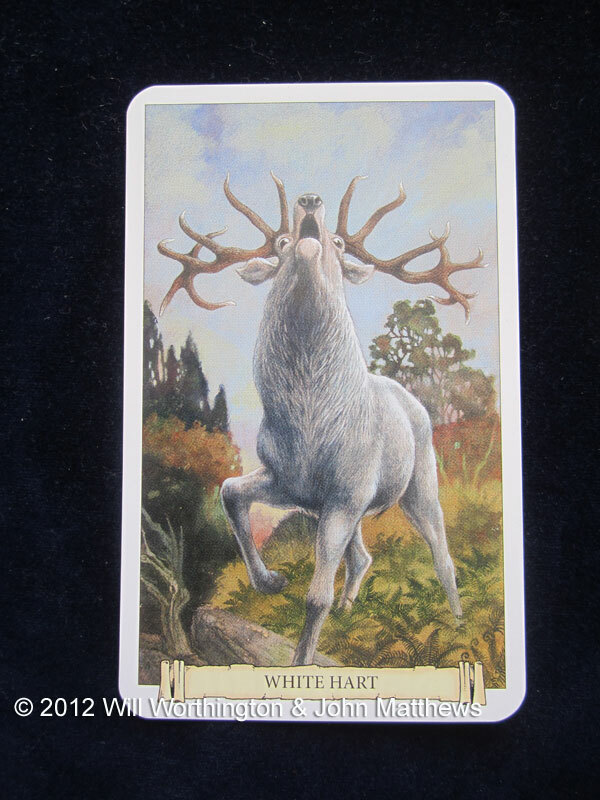 The White Hart was often seen as the ultimate challenge and adventure, yet whenever he was spotted, the adventure became far more. To the ancient celts, all and any white animals were magical. The saying goes that anyone who captured the White Hart could demand a kiss from the prettiest girl in the court. The first time the White Hart is seen in the legends is when the beast itself enters the hall of Camelot, being chased by a dog who was followed by a damsel who was carried off by a stranger. Three knights scattered, one after the Hart, another after the dog and a third after the lady. Arthur and the rest of the Knights hunted such creatures, often being taken into fresh adventures as a result. I’m sure you’ve heard of a lucky rabbits foot etc. Not so lucky for the poor rabbit but perhaps for the person who holds such items (horseshoes, antlers etc.) it may signify luck. The White Hart is good at showing you what path to take, and since you may not understand what it tells you, it shows you in the form of a white animal that you’ll just want to follow because it’s strange, different, unique. The White Hart isn’t shy about providing tests and trials, but he also provides a way to discover what is required to solve issues, what you need to negotiate difficult decisions. Here’s some questions for you. What are you really chasing? If you were to catch it, what will you do with it? Are you the hunter or the hunted? Do you have a fall-back position? Are you prepared for what happens next? What’s your purpose on this challenge? What truth is hidden from you? So, that concludes us with the introduction to this deck, I’ll switch Oracles next week, but I haven’t yet decided what to switch to, so stay tuned! Deck used was the Camelot Oracle by John Matthews and illustrated by Will Worthington. I suppose I am often the hunter but when it comes to making the final kill I back away. Too afraid to make the wrong choice. Sometimes I get hunted down after that and sometimes I am both hunter and hunted. Aren’t we often our own worst enemy? Fear can be paralysing but I learned a long one ago fear can’t stop you unless you want to be stopped. Hunter or hunted, were often one or the other and yes, we’re often harder on ourselves than we are on others.